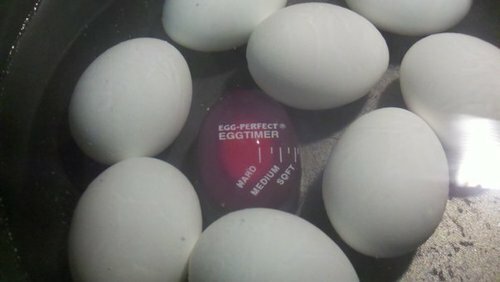 I find I always have trouble scaling the amount of time the eggs should be boiled, cooled, etc. for different-sized batches of hard-boiled eggs. I've heard a variety of "folk lore"-type rules for how it should be done, but what's really the right way? I've never adjusted the length of time based on number of eggs. As long as the water is boiling I don't think it would take any longer to cook a dozen than to cook one (it might take the water longer to come up to boiling, I guess). For hard boiled I normally bring them up to the boil and then turn the heat off, and leave them for 15 minutes. If you like them less well-cooked, you could reduce this to 12 minutes. Then empty the pan and re-fill it cold water a couple of times to cool them down quickly. Leave rest of them sitting in the cold water while you prepare each one. While this is for soft-boiling eggs, I believe you can easily adjust it for hard-boiling. While for me this is far more complicated, if you're interested you can read all the details in the post "Towards the perfect soft boiled egg". I don't boil eggs enough to keep a feel for the timing... So a few years back, I picked up a handful of these. They're sold under a few different names, but the idea is the same: sturdy plastic that changes color as it heats. Drop it in with the eggs, and pull & chill them all when the color band hits the spot you're looking for. Don't cook eggs straight from the fridge, let them adjust to room temperature. For soft boiled eggs, place them in boiling water (enough to cover the egg by about 2cm) for one minute. Remove from the heat and cover. Leave them for approximately 6 minutes. For hard boiled eggs place them in boiling water and simmer for about 6 minutes. Once done cool them as quickly as possible, by running them under cold water. Timings may have to be adjusted slightly, depending upon the freshness of the eggs and also personal preference. My mother taught me this way: eggs not straight from the fridge but don’t have to be room temperature. Use a small saucepan with a lid. (However many eggs, use a saucepan big enough so the eggs don’t touch each other or the side of the pan.) Cover the eggs with fresh water & heat to boiling. When they get to a rolling boil, turn off the burner & cover the pan. Let them sit on the burner for 20 minutes. I get perfect hard-boiled eggs with this method with either electric or gas range. Running cold water over them in the pan both makes them easier to peel and stops the cooking. If you've got a sous vide setup you can set it for about 166ºF-ish for an hour and ensure they're cooked to perfection. However, you need to make sure that you've got it exactly that temperature as if you're too low the egg will come out runny. It's still safe, and arguably tastes better, but it's not hard boiled. In fact, this method doesn't boil the eggs at all, so I guess they're "hard cooked". For a visual representation how minute changes in temperature changes the compositions of an egg see Figure 4.1 of Douglas Baldwin's "A Practical Guide to Sous Vide Cooking".